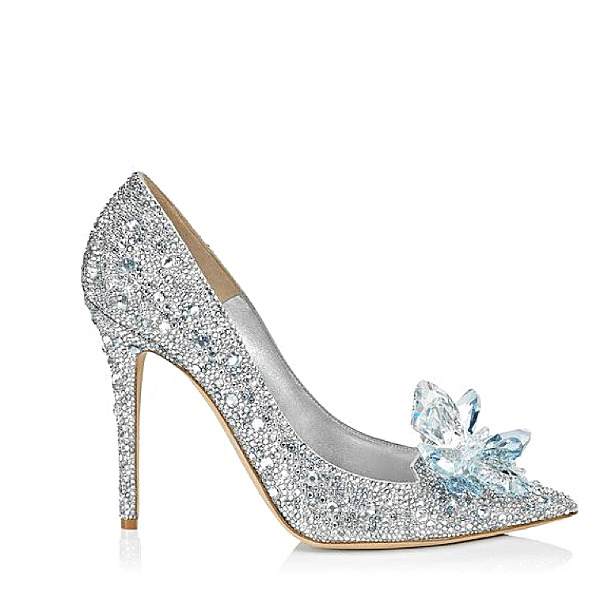 Crystal Covered Pointy Toe Pump ‘Cinderella Slipper’. In celebration of the release of Disney's live action film inspired by the classic fairy tale Cinderella, Jimmy Choo Creative Director Sandra Choi has designed an enchanting shoe which reimagines the iconic glass slipper. This beautiful creation has been developed with a base of the iconic Jimmy Choo pointy toed pump, and then decorated with thousands of Swarovski crystals of varying sizes. A 'crystal cluster' is hand embroidered to the toe of the upper, leaving a truly magical finishing touch. Made in Italy with a shimmer leather upper, leather sole and insole. The shoe has 7000 crystals and 46 embroidered stones fixed to the upper. Heel height measure 110mm/4.3 inches. A personalised monogram can be added to the sole of your shoe. The shoe is also available to purchase online for a limited time only.